Pulling a 164,000-pound plane?! Who does that? Instantly, a picture of Superman or Wonder Woman comes to mind. Have you ever secretly thought that you, too, are a superhero, and could demonstrate your powers if only given the chance? Or maybe you KNOW you are a superhero, and fight the good fight every day! Either way, on Saturday, August 12, 2017, Denver International Airport, Signature Flight Support, and Special Olympics Colorado will provide a chance to showcase your powers for good. Special Olympics Colorado’s Plane Pull presented by SUBWAY Restaurants is a giant tug-of-war between your team and a 164,000 lb. airplane. 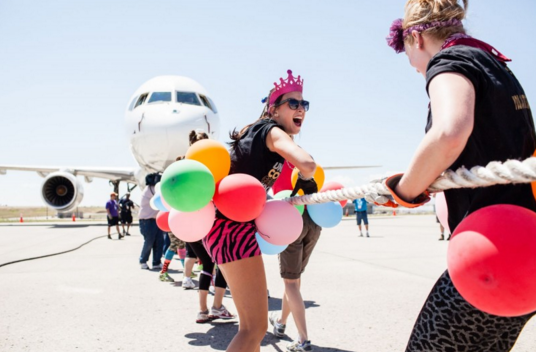 Teams challenge each other to pull a jumbo jet 12 feet across the tarmac in the least amount of time. Each team is asked to raise a minimum of $1,250 to participate. Not only will you have an opportunity to be part of a team of superheroes like yourself, all funds raised help Special Olympics Colorado provide year-round training and athletic competition to thousands of athletes with intellectual disabilities across the state of Colorado. A win-win for super heroes of all abilities! Bring your friends and family out to enjoy the festival-like experience with free sandwiches provided by Subway, a bouncy house, bungee trampoline, Segway ride, and much more. 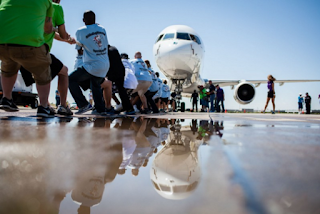 Interested in making history as part of the first CDPS Plane Pull Team? Register today with TEAM CSP. All CDPS employees, family, and friends are welcome. Booked to save the planet elsewhere that day, but would like to support the effort? Donate! Even a few dollars can be mighty in strength. Pull together, Win Together! For more information, contact CSP Sgt. Rob Madden at 303-239-4574.